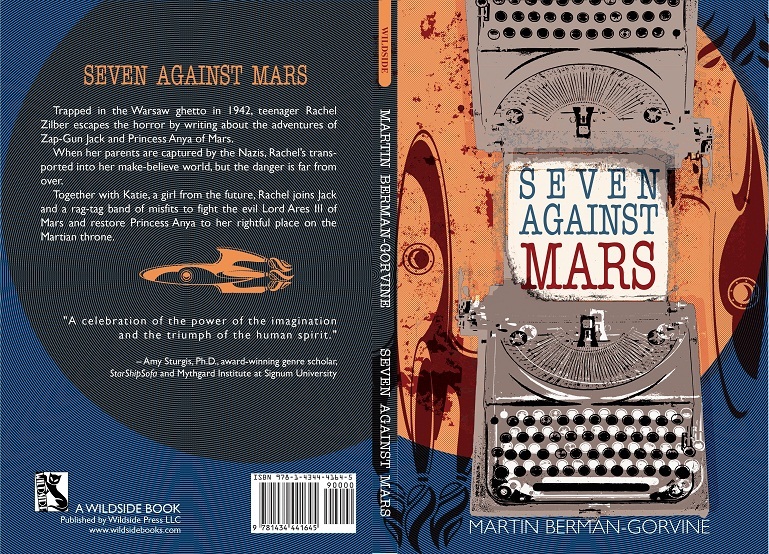 Excerpt from Martin Berman-Gorvine's novel, "Seven Against Mars"
Nominated for the 2014 Prometheus Award for Best Novel. Seven Against Mars had me hooked from the first page, and it never let me go. Berman-Gorvine's clever send-up of and heartfelt love letter to the science fiction pulp era delivers both laugh-out-loud wit and a poignant look into timeless issues of prejudice, oppression, and the persistence of evil. Most of all, this novel is a celebration of the power of the imagination and the triumph of the human spirit. It serves as a powerful reminder of why we fall in love with science fiction in the first place and how much the genre can tell us about our pasts (cue a gifted Polish Jewish dreamer during World War II), our futures (cue a feisty young Texian from a post-U.S. North America), and our hopes for heroes (cue a determined Martian princess and a daring adventurer with a zap-gun). Adults should share this with the young readers they know but be certain to keep a copy for themselves. Buy Seven Against Mars in paperback for $10.99 plus shipping at Amazon.com or via the website of the publisher, Wildside Press. Excerpt from Chapter 1: Jack said, "How did you know my girl—the name of the princess? And how come you’re the only offworlder I ever met who can pronounce the Venusians’ true name?" "Because I'm the author. I made all this up. I made you up, Zap-Gun Jack. So I know all about you. I know what happened to Jim. It wasn't your fault, and anyway, he’s not really dead, he..."
Karolla bounded into the clearing. Katie shrank back, her arm over her eyes, but Rachel only muttered, "No no no, I said seven fingers. Seven! Oh…I see… that one’s just so much smaller than the others..." The creature’s fur was mottled, providing better camouflage with the jungle foliage. I don’t remember thinking of that.